Shawn Howell was elected to the Board of Directors in 2008 and is currently serving his second term of office. Since attending the basic class, Shawn has served continuously on the training committee and as a CFCE coach. He has been involved in every training event since receiving his initial certification; having served as classroom staff, instructor, course developer, editorial staff, and as the Chairman of the BCFE class. Shawn began his work in the field of computer forensics while serving in the Washington Air National Guard, assigned to the Washington State Patrol as part of the Counter-Drug Task Force. Since first becoming involved in the field of Computer Forensics, he has been a full-time Forensic Computer Analyst. After leaving the Counter-Drug Task Force, Shawn became an employee of Computer Forensics, Inc. in Seattle, WA where he became the company’s first Lab Manager. In 2002, he left the Seattle-based company and returned to LE support as the Lab Manager of the U.S. Department of State’s Computer Forensics Lab. As a government contractor, Shawn worked for Paradigm Solutions as the Director of Forensic Services, overseeing multiple government computer forensic contracts and operating a subsidiary for Paradigm Solutions called Cyber-Tech Forensics. Shawn went on to work on contracts with General Dynamics and Sotera Defense Solutions, both in support of the U.S. Department of Homeland Security. Shawn left government contracting and returned to government service as the Forensics Team Chief within the U.S. Department of Homeland Security. 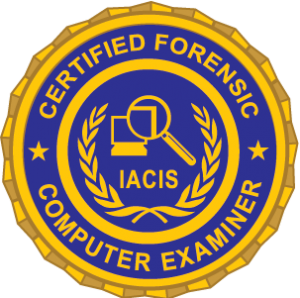 Shawn holds multiple certifications in digital forensics and digital forensic tools with the most notable being the CFCE. Currently, Shawn is the Vice President and also serves as the Chair of the Competencies Sub-Committee under the Director of Standards.